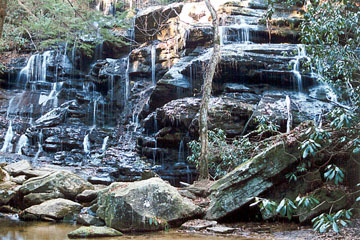 Yellow Branch Falls, located in the Yellow Branch Picnic Area above Walhalla, is not what you expect when you hear the words "falls" and "branch" in the same title. Furthermore, my pictures just can't do it justice. Stream flow on the Yellow Branch does not inspire awe, but the sheer size of the falls do. 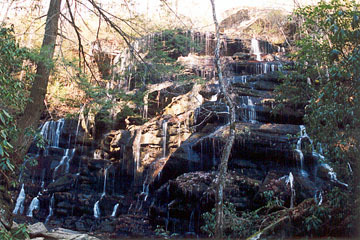 Yellow Branch Falls is 50-feet high and 75-feet wide and nestled in a forest cove. The recently constructed 1.5 mile trail is moderately difficult, but well-worth the effort. Notice the man at the base filling a cup with water. 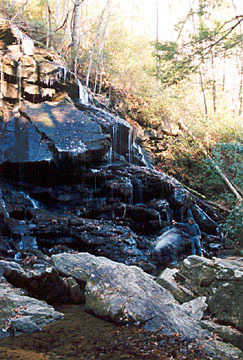 It is not wise to drink water from mountain streams and creeks. They contain some nasty bugs that can cause serious intestinal problems. Always carry enough water or plan on filtering/purifying stream water. Directions: From Walhalla, take SC 28 north for six miles. If you pass the Stumphouse Mountain Ranger Station on your right, you have gone too far. 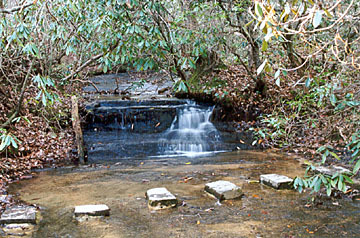 The entrance to the Yellow Branch Picnic Area is on the left before the ranger station. After you turn off SC 28, stay straight and do not turn right on the road going uphill. Follow the road until it deadends in a circular parking lot. The trail starts on the side opposite the portajohn. 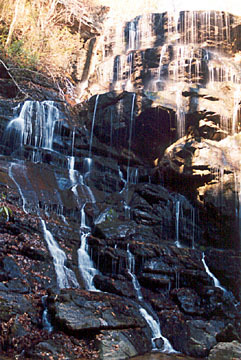 Look for the bulletin board describing the trail to the falls.